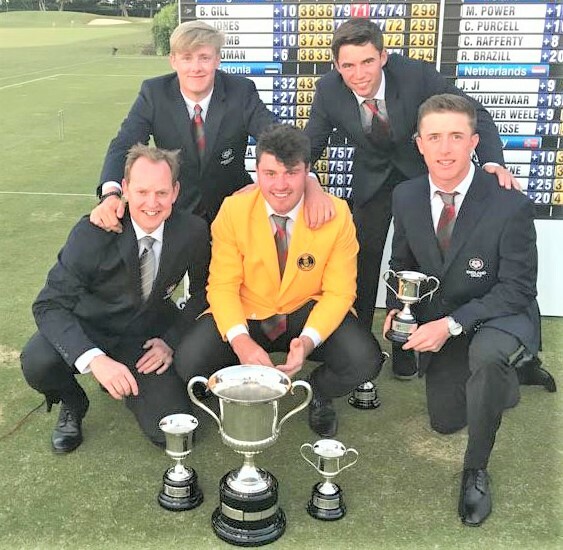 Back row, from left, Tom Plumb and Bailey Gill; front row, from left, Gareth Jenkins, Tom Sloman (wearing winning individual's yellow blazer, and Ben Jones. The men won by eight shots at the end of a tough week, when a brutal wind made playing conditions difficult. Ireland finished third, Wales fourth and Scotland (E Walker, E McIntisoh, K Cantley and J Johns) eighth. England men’s team manager Gareth Jenkins commented: “This is a tremendous achievement. His dramas continued until the 18th, where his drive finished in the trees, but he managed to salvage a par by holing out from 15ft, completing the last five holes in one-under. Germany’s Jannik de Bruyn missed from 4ft, failing to force a play-off with Sloman. Scotland finished T7 in the women's team event won by Holland.